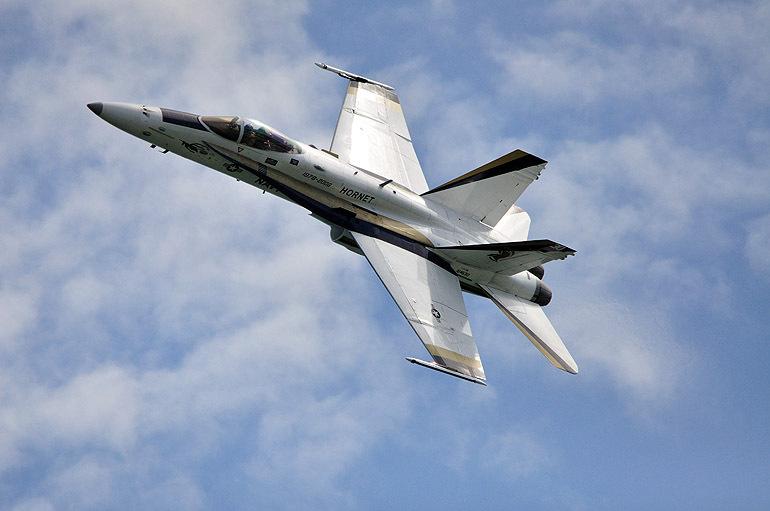 The Navy's F/A-18 Hornet put on a lengthy show, making countless passes at varying speeds. 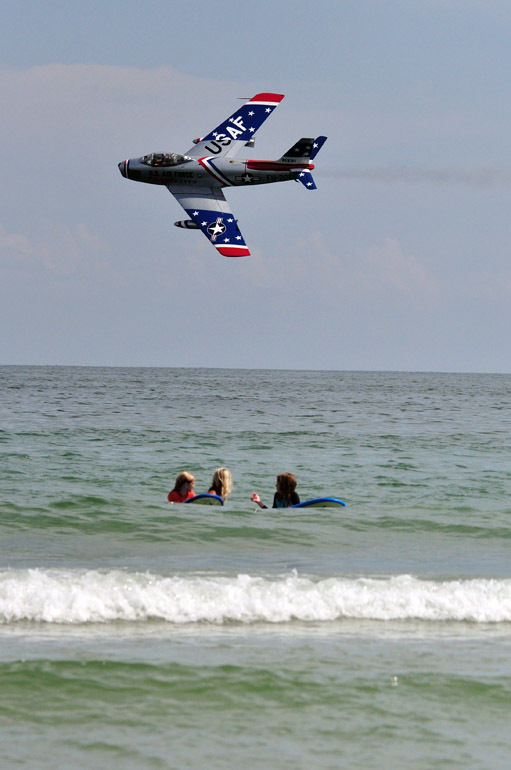 This banking maneuver was performed during a subsonic flyby of Cocoa Beach. 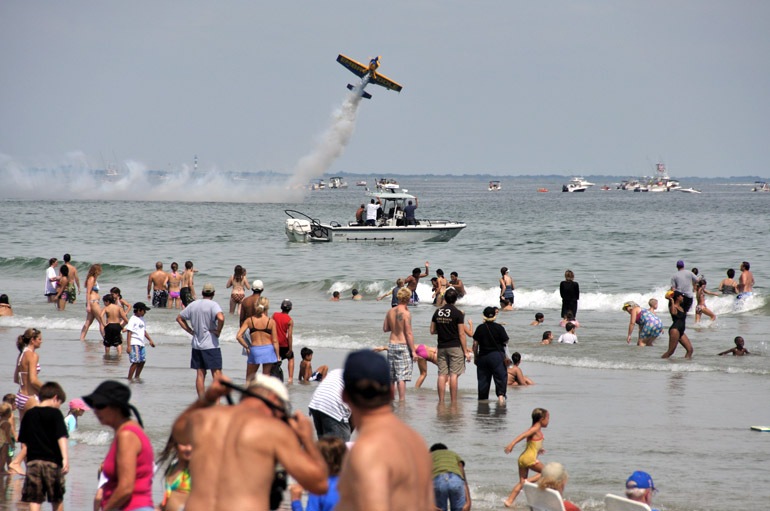 The Cocoa Beach Air Show was devised by organizers to be an economic engine during a typically slow tourism period for the east coast of Central Florida. Normally, it would have been something that easily would have attracted me. 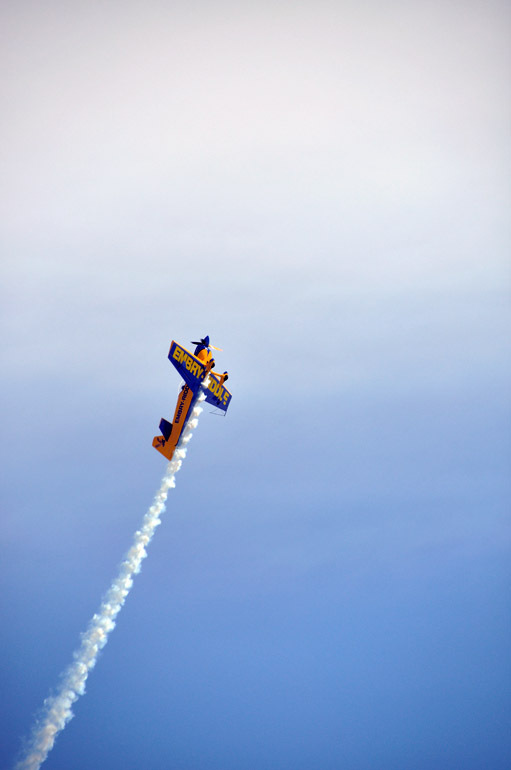 I had never photographed performing aircraft, and I was up for something new. But the show came at an inconvenient time. It was during the weekend before my trip to Maine, and the best day, when the F-22 Raptor was set to make a flyby of the beach, was Oct. 4, the day before I left. Packing my bags was consuming most of my time on that Sunday. But in spite of a lack of preparation, I headed to the beach. 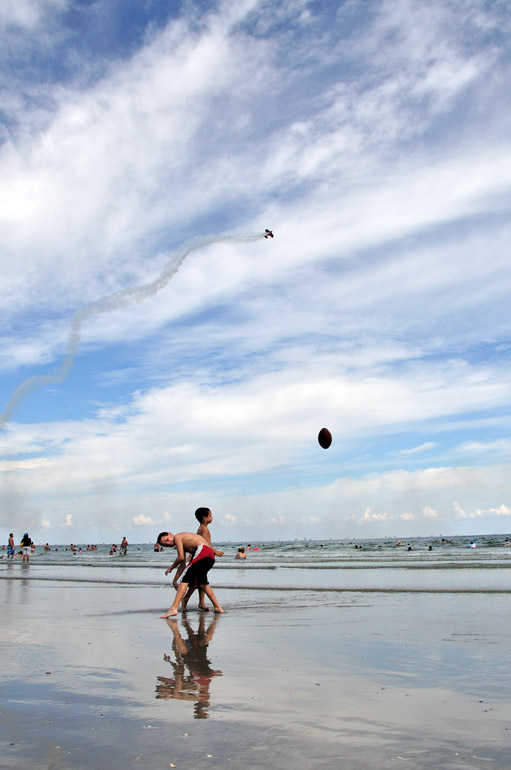 There were attendance estimates in the region of 30,000 people, and I knew Cocoa Beach can get packed for events such as a space shuttle launch or a fireworks display. But when I arrived at the beach, parking was a breeze. The show had already started, though, and I missed the one pass made by the Raptor. But there were still several interesting aircraft left on the program. 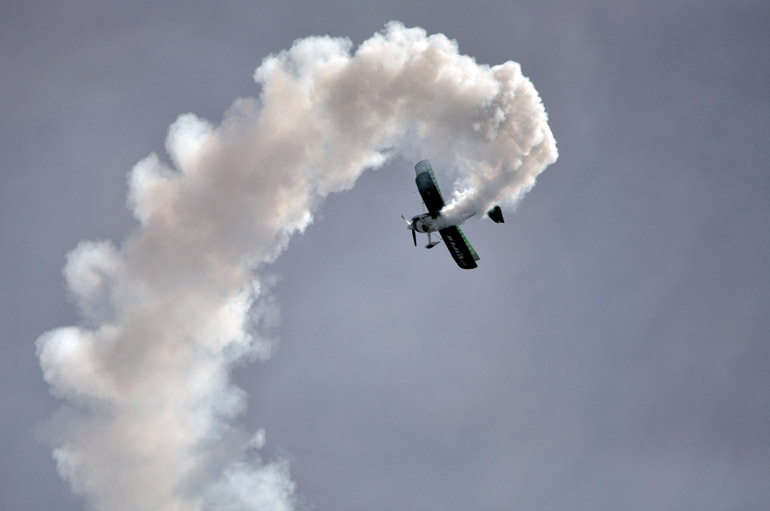 Pilot Jason Newburg in his Oakley-sponsored Viper biplane spirals downward as a smoke gun adds effect. Most of my shots during the show were taken as I stood on the sand. This one, though, of the Oakley Viper was shot from a boardwalk over the dunes. As the airplane zipped by, I continued to follow it with my 150-500mm Sigma lens, maintaining the focus point. That resulted in the plane being in focus for this shot taken through the high grass on the dunes. The Oakley Viper heads into the blue sky. I hauled only one camera with me to the beach. When I'm dealing with sand, I use as little photo equipment as possible so I don't have problems juggling all of it, risking a tragic drop. 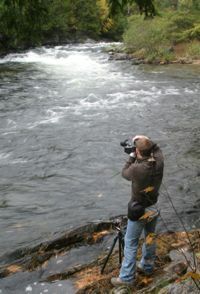 With only one camera, though, I had to switch lenses often to get wide-angle shots such as this one. The internationally known Embry-Riddle Aeronautical University in Daytona Beach sponsors Matt Chapman and his Mudry CAP 580. 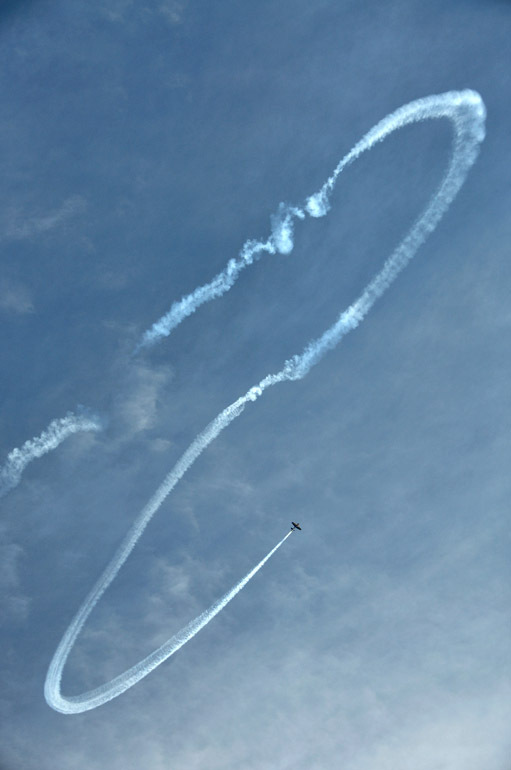 The sky was ever-changing during the air show: With several aircraft emitting smoke, there appeared to be constant cloud cover, even though it was a rather clear day. I like the natural blue-to-white gradient in this photo. Chapman flew low over the Atlantic Ocean, then pulled up sharply. Here, it sort of looks as though the airplane is emerging from the water. Air Force parachutists jumped out of that plane soon after this was taken. Of course, I didn't know that would happen at the time. 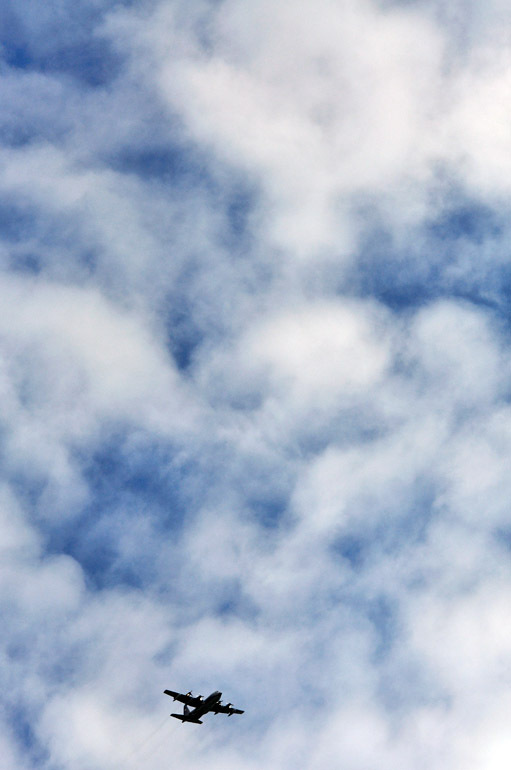 I was just focused on capturing the plane and the clouds. 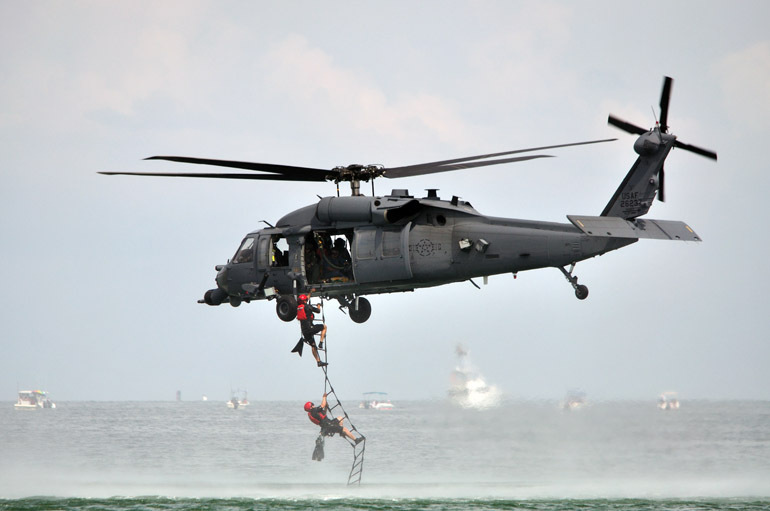 The airmen from Brevard County's own 920th Rescue Wing, who jumped out of the plane shown previously, swam around in the warm Atlantic for a bit until they were given a ladder to an awaiting HH-60 Pave Hawk helicopter. The 920th responds to disaster situations worldwide and to ones closer to home, including Hurricane Ike last year in Texas. 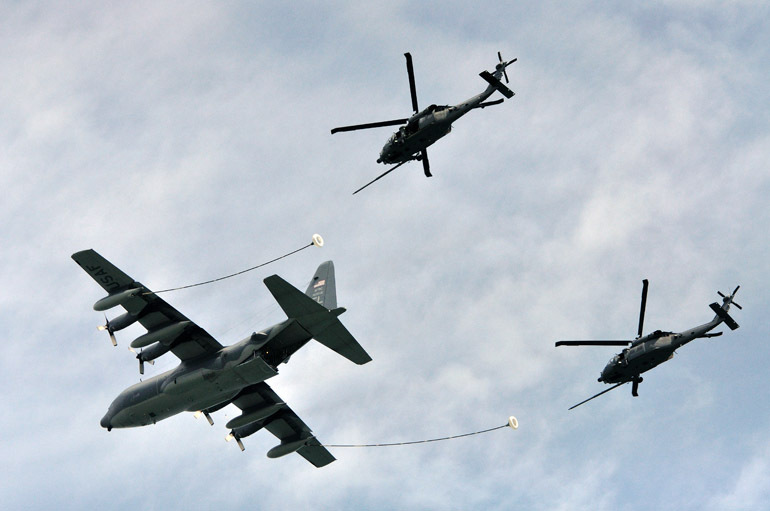 The 920th Rescue Wing demonstrates midair refueling. No link-up was actually made; they just flew the length of beach in this same formation. The F-86 Sabre, built by North American Aviation, was a dominant jet fighter for the United States starting in the late 1940s and early '50s. 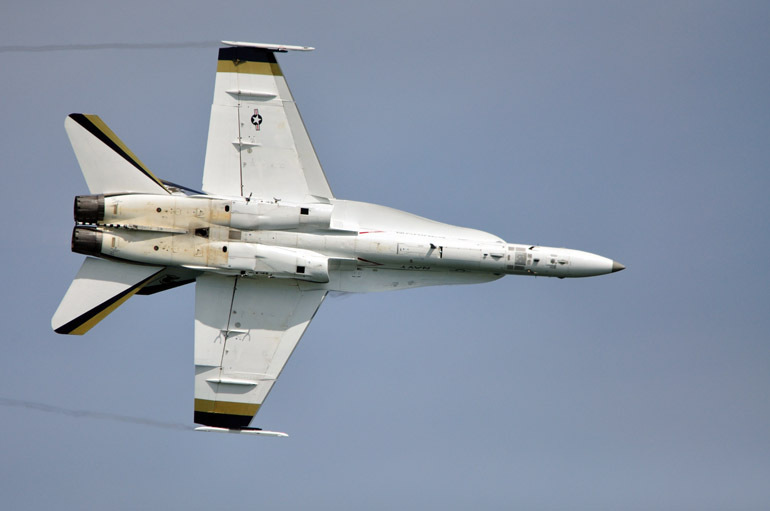 The aircraft is emblazoned with the "Skyblazers" name, an Air Force demonstration team that has been disbanded. 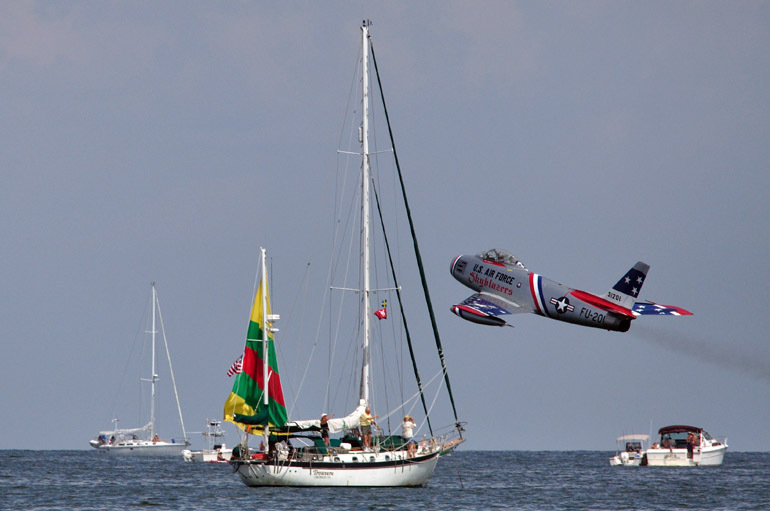 The jets still appear in aerial demonstrations, however, as heritage fliers. The Sabre makes a quick pass of a group of swimmers off Cocoa Beach. Following such a fast aircraft with a 500mm lens isn't easy. 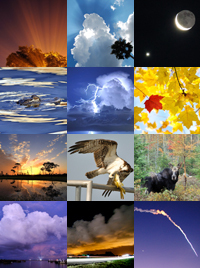 Doing it in portrait mode - vertically - was even more difficult. 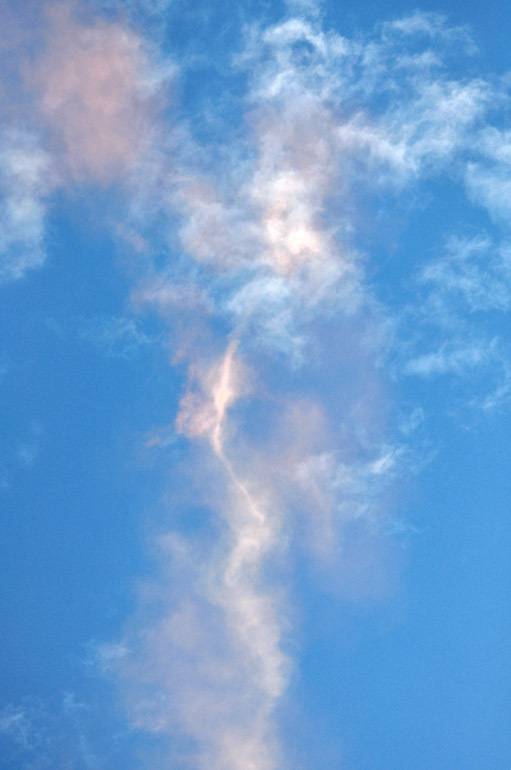 A red smoke trail left by the plane below. 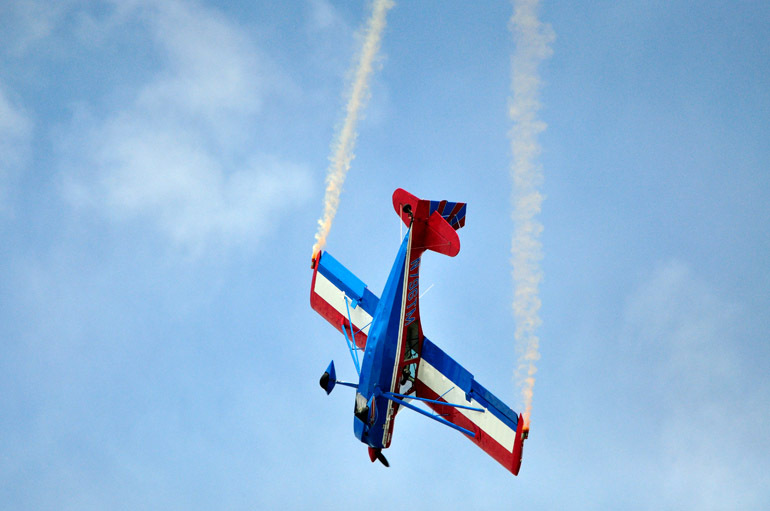 John Black performed for about 10 minutes in his 8KCAB Super Decathlon. 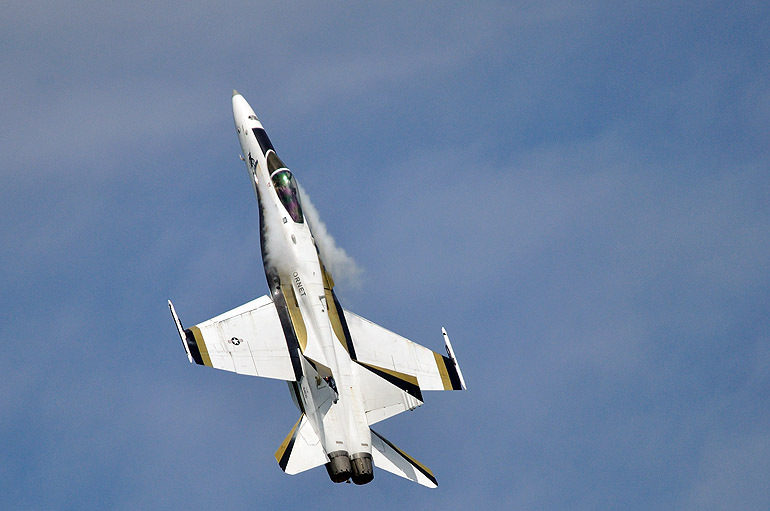 The Navy's F/A-18 Hornet put on the best show, by far. No fancy smoke with this one, just pure power. 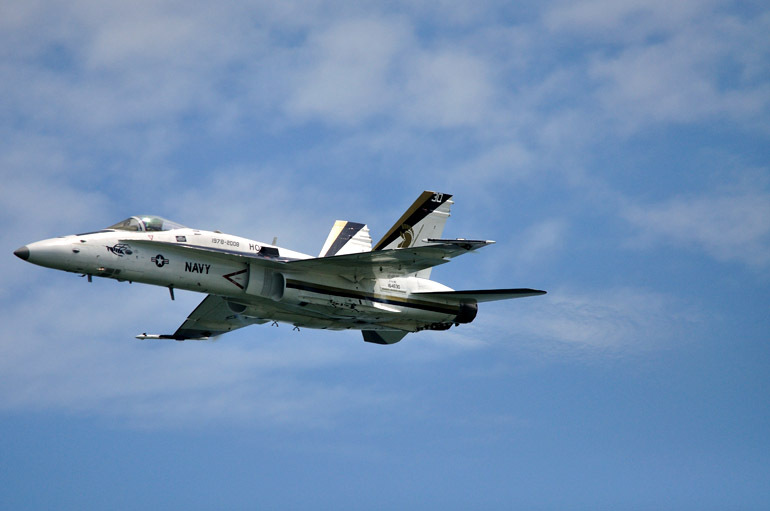 Heat rippled behind the Hornet's twin engines, just before the plane went supersonic. 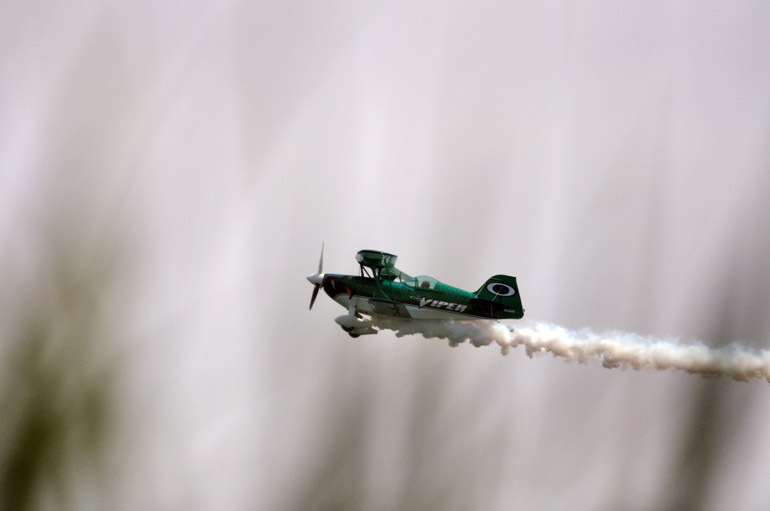 Shooting an airplane that is traveling faster than the speed of sound can be difficult. 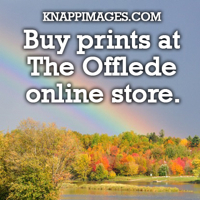 Having been a trap shooter when I was younger, I'm accustomed to finding a target and following it. So I had that part down. The next aspect is camera settings: I used the fastest possible shutter speed, 1/4000th of a second, and an ISO speed of 400 to allow more light to hit the sensor on account of the accelerated shutter. 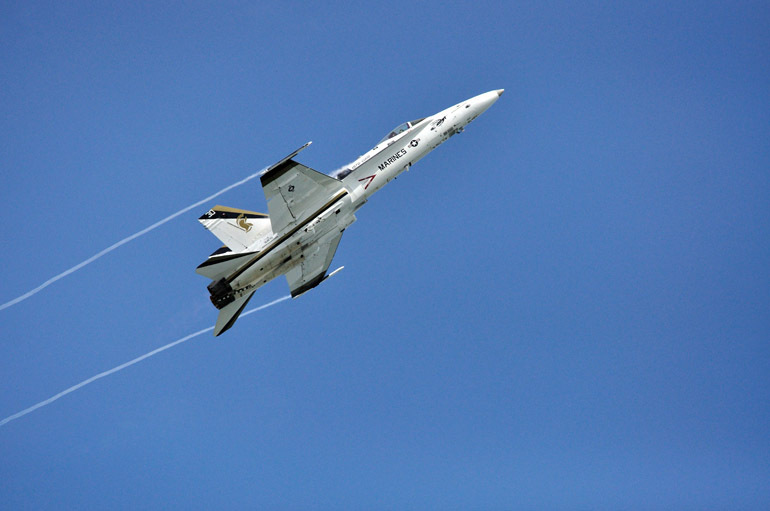 Vapor streams form on both sides of the Hornet's cockpit as the aircraft pulls up. 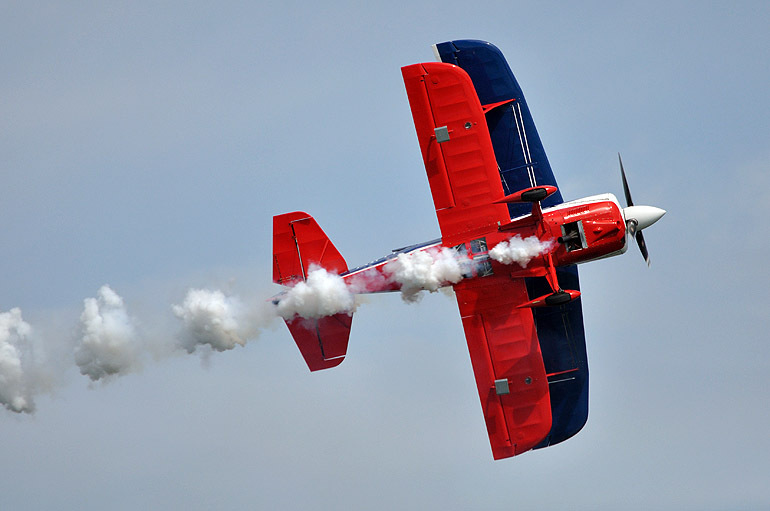 Pilot Ed Hamill's AFR biplane emitted the most photogenic puffs of smoke. His plane is sponsored by the Air Force Reserve. 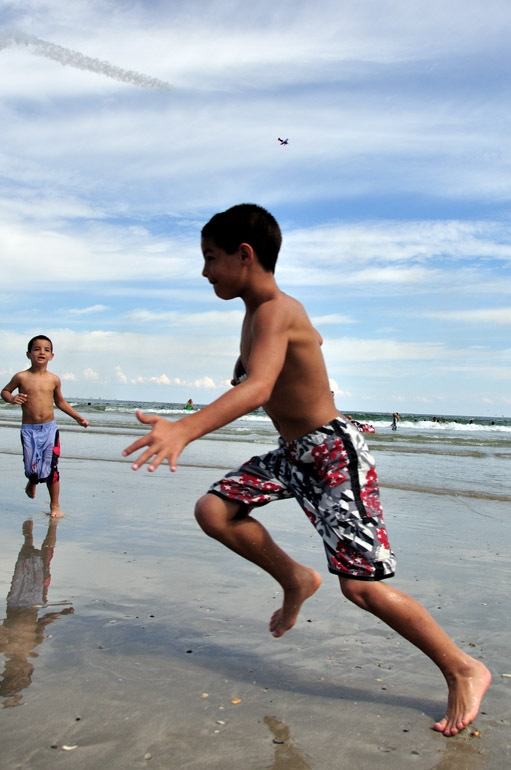 Children play football on the beach as Hamill performs. 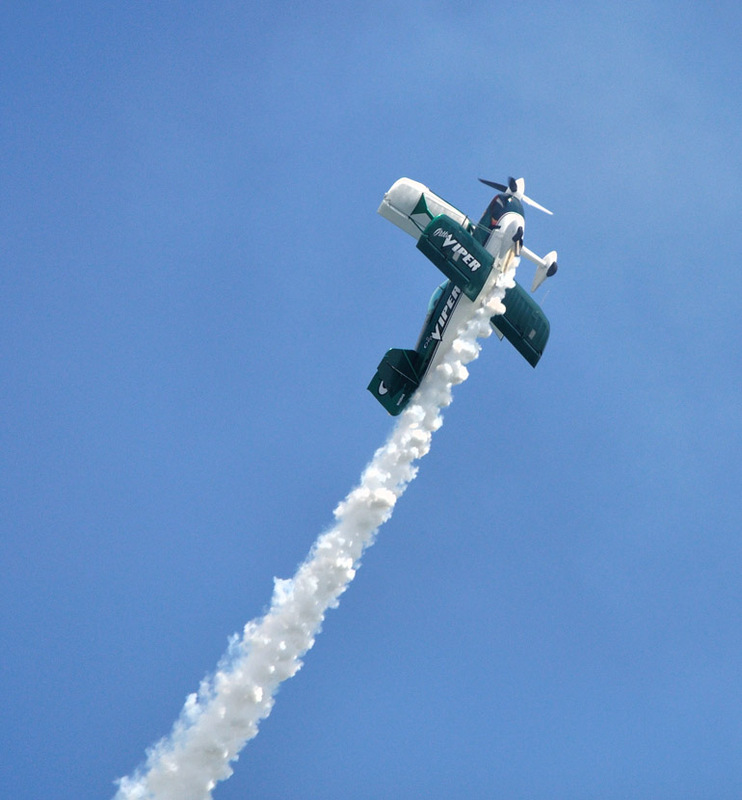 The second Cocoa Beach Air Show has been planned for late October 2010. How is it that you know so much about these things, Mark? Ha. Thanks.